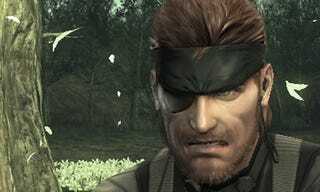 During Nintendo's E3 press conference earlier today, the Metal Gear Solid series made a surprise appearance courtesy of a short tech demo. Here are some screenshots from that demo. Remember, this is just a demo. All we could do at the hands-on event was guide a camera around, checking out the action in the third dimension. But hey, it's Metal Gear! On a new Nintendo handheld!